First FO’s of the Year! Wow, it’s the end of January already! I might be having a harder time with how fast this month went because we’ve had such a mild winter in the Great Lakes so I’m not quite as worn down by snow and cold as I usually am at this time of year. It’s a good thing because this is the first time in two years that I have not had a trip planned to a more tropical destination in February so thanks winter for working with me this year! Either way, I’ve had plenty of knitting time this month but that will not necessarily show in my FO’s for the month. After all the Christmas mermaid blankets, I took a short break and then started work on a fourth one which was also a special order (yea for Knit Picks after Christmas sale!) As long as I was ordering, I decided to do a scrap mermaid blanket and donate it to our youth group raffle that is held during our Lenten fish frys. I needed a couple more full skeins and then used leftovers from the Christmas order to make a rainbow mermaid. Initially I started working on the private order but was told there was no rush and the first fish fry is February 19 (Easter is super early this year!) so I switched and cast on the rainbow mermaid which is why my actual number of finished items it low this month. Here’s a picture of the rainbow mermaid. 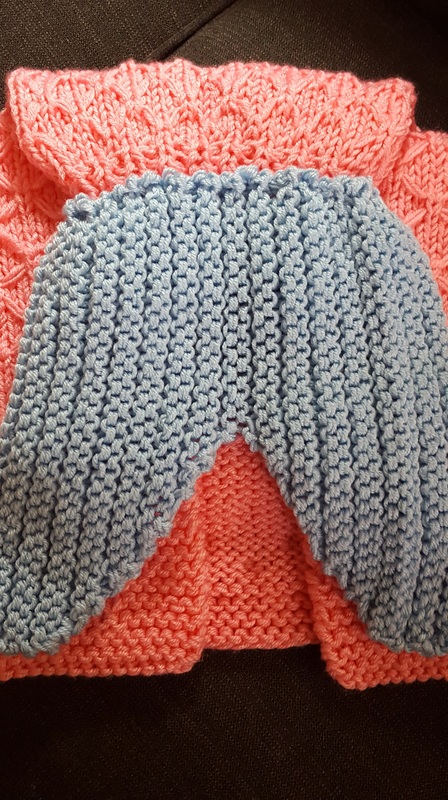 As usual, I used the Mermaid Tail Lap Blanket for Children and Teens by Angie Hartley which you can find on Ravelry or her Etsy store and used Knit Picks Brava Worsted and held two skeins together. The instructions for the heel only include the heel so I broke out my Sock Architecture book to find a new toe to try. Now, for some reason in all my knitting years no one ever told me that there are toes that do not require kitchner stitch – it was like a whole new world opened up to me!!! I did the Round Toe and love, love, love it! Well, a week ago I was afraid this would be my first month without a FO and that was very sad but a couple of things happened that have led to two FO’s! 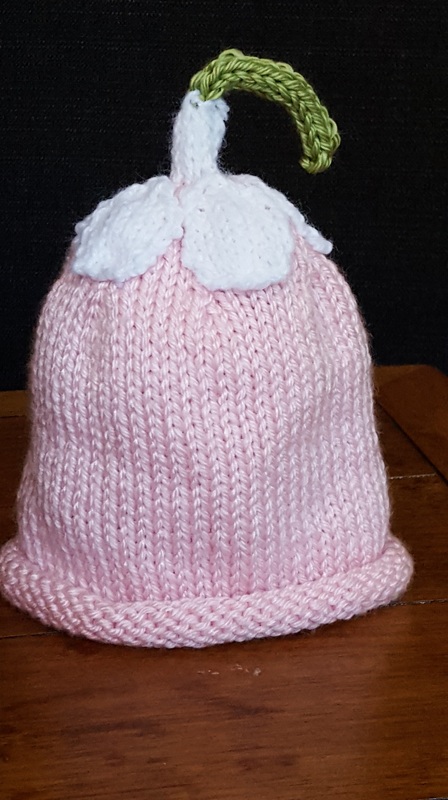 First up – the Upside Down Daisy Hat by Susan B. Anderson. You can find it in Itty Bitty Knits (check your library!). I have to say that it was this book that really turned me on to knitting baby hats. If you do have lots of little people this book is a must own. I’ve made many of the patterns and a few them (such as the Daisy) I’ve made multiple times. It’s my go-to book for the little ones. I have friends who are active foster parents and they were blessed with a newborn baby girl earlier this month and so the Daisy seemed perfect for her. I realize it’s October and a pumpkin would’ve been more seasonally appropriate but my friends currently have a little boy and I know they have been craving pink in their home so I wanted something very girly and a pink daisy is nothing if not girly. Plus, a little ray of sunshine in this very dreary time of year is always nice. The next thing that happened was that the project I was working on finished up last week so I’ve had some time off before the next project starts which gave me some much needed time to work on an order I have for Christmas. Of course, I’m talking about the mermaid lapghans that are all over the internet. My friend has ordered one for each of her two daughters. I ordered the yarn from Knit Picks and I’m using the Brava held doubled. The price and quality of the Brava can’t be beat so I got a huge box of Brava in the mail and started off. The first one was requested to be pink and the second purple and I’m putting a blue fin on the pink one and a green fin on the purple one. I started the first one about a month ago and this week was just what I needed to finish it. They look like a lot of knitting but they really knit up fast. The fish scale stitch is fun and seems to keep it moving along. I’m taking a couple of days to cleanse my palette with some of my other neglected projects and then start number 2 on Monday. Apologies for the picture – I could not get the colors to turn out right in any kind of light so it’s a bit more vibrant in person!